Along with Kevin Eng, Andrea Westaway, Tim Mah, Graeme Guimond and all the Vancouver Cansing Choir members, I invite you to LIFE HAS LOVELINESS TO SELL, 7pm, Friday, March 1st, Charles Tupper Auditorium. The uplifting songs from all genres were chosen to fit the theme of Sara Teasdale’s poem “Barter” (Life has loveliness to sell). I hope “everything is great” and you can join us! Thank you to Makeesha Fisher for the beautiful poster! 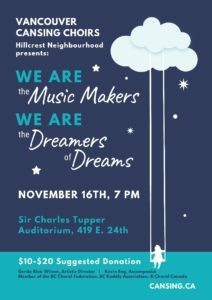 Chase away the November rains and join the youth and adult Vancouver Cansing Choirs (Hillcrest Neighbourhood) for WE ARE THE MUSICMAKERS, Friday, Nov 16, 7pm, Charles Tupper Auditorium. Admission is by donation ($15 – $20.00 suggested amount). The songs will include selections from GF Handel, Brian Tate, Gene Maclellan, Jim Papoulis and a mass choir selection of Enya’s Echoes in Rain by Gerda Blok-Wilson. It’s a tradition for the audience to sing at our shows and you will have a chance to burst into song on All I have to do is Dream by (Everly Brothers). 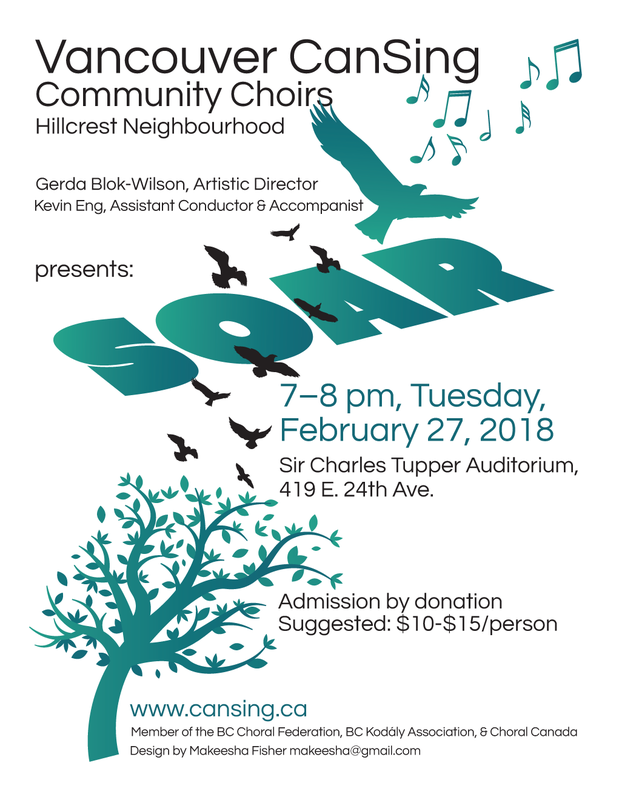 Along with Gerda Blok-Wilson (Artistic Director) and Kevin Eng (Assistant conductor, accompanist), we hope you can join us! Member of the BC Choral Federation, BC Kodály Association and Choral Canada. 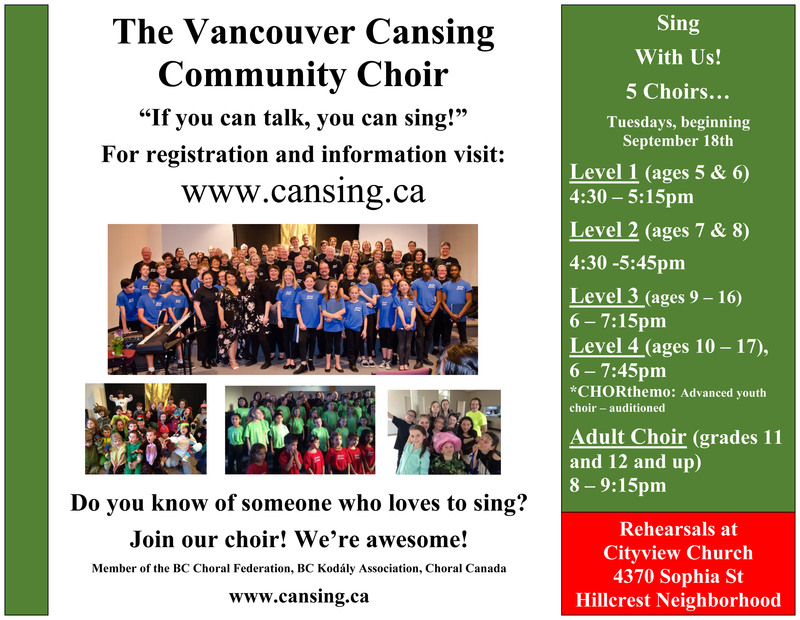 The Vancouver CanSing (VCS) 2018 fall session registration is open! All rehearsals begin Tuesday, September 18th, Cityview Church, Hillcrest neighbourhood. We welcome new members (youth and adult) who LOVE to sing and perform all kinds of music. Please help us get the word out. Feel free to share via email, Facebook, Twitter, newsletters so the word gets out to people who are keen to sing! To register, see the choirs below and click for information and instructions. The choirs will begin rehearsing for the 60 – minute show, WE ARE THE MUSIC MAKERS AND WE ARE THE DREAMERS OF DREAMS, Friday, November 16th, 7pm and will feature thematic songs from the classic, jazz, popular, musical theatre and folk genre. A more detailed list of music repertoire will be sent to registrants at the end of June. Wolfgang Amadeus Mozart is perhaps the most recognized composer of all time. He is not only known as one of the most famous child prodigy in music history but also as a brilliant composer in his adult life. 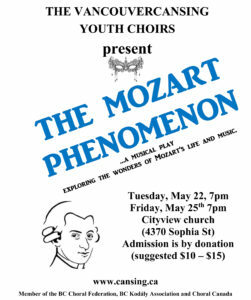 The Vancouver CanSing CHORthemo and Level 3 youth choir, directed by Gerda Blok-Wilson and accompanied by Kevin Eng will present performances of THE MOZART PHENOMENON, Tuesday, May 22, 7pm (Community Show), and Friday, May 25th, 10:30am & 1pm (School Shows) and 7pm (Community Show), Cityview (4370 Sophia St). Admission is by donation (suggested $10 – $20). Crazy, zany and eccentric Mozart’s personality and music speak to everybody, of any age and on any level of musical experience. 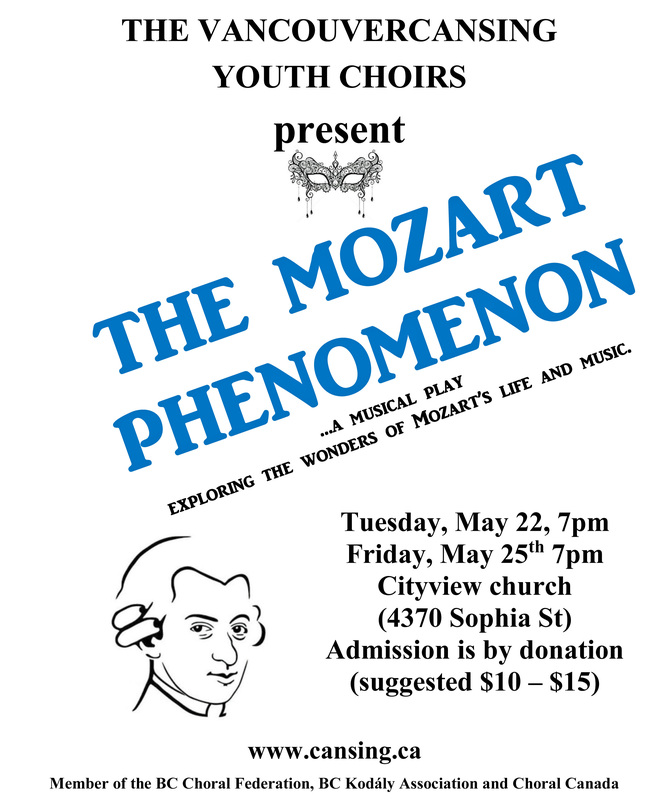 This 50 minute musical play explores the wonders of Mozart’s life and music in a fun way. The audience will be transported back to the 18th century along with the two main characters, Katrina and Karla, and their new found friend, Mozart. From touring Europe with his older sister, Nannerl, and playing for kings and queens in the great courts as a young child to his continual search for employment, family life, development of his operas and the mysteries behind his death, the audience will enjoy discovering the phenomenon of Mozart’s life and music. The choir is a member of the BC Choral Federation, BC Kodaly Association and Choral Canada. 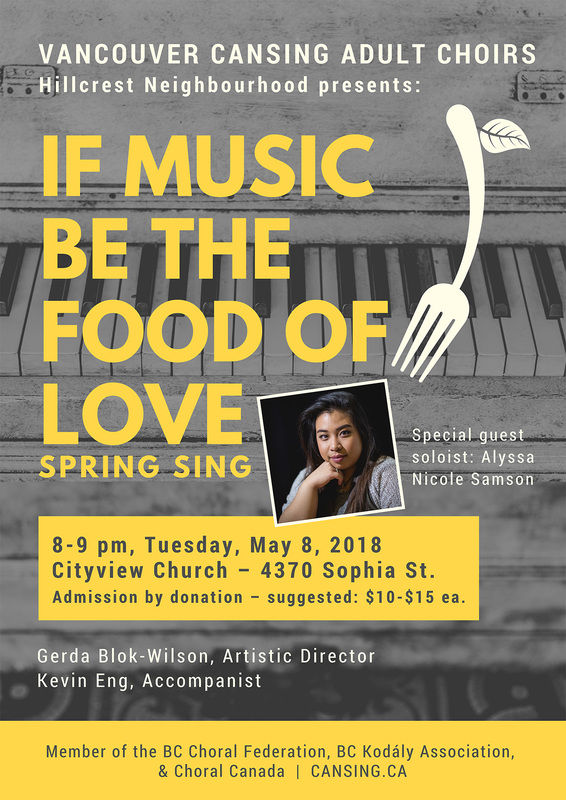 Vancouver CanSing Adult Choir will present IF MUSIC BE THE FOOD OF LOVE, Tuesday, May 8th, 8 – 9pm, Cityview Church (4370 Sophia St – 5 mins East from Main & 28th). Admission is by donation (suggested $15 – $20.00 to cover rent and professional fees). The choir will perform seasonal songs by Handel, Purifoy, Joel, Tate, Bernon, Blok-Wilson and more. Our programs are always entertaining. We hope you’ll join us! Please help us spread the word to family and friends. 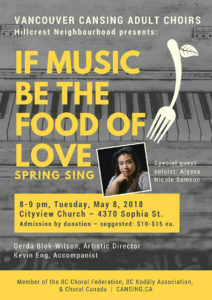 Special guest soloist will be Alyssa Nicole Samson, UBC opera student. This is the second year that the choir has supported an emerging vocal artist and we look forward to sharing the singing experience with her! Vancouver CanSing Choirs will explore songs that “Soar” Tuesday, February 27, 7pm, Tupper Auditorium (419 East 24th). Including works by Eric Whitacre, Ola Gjeilo, Giuseppe Verdi. Jeanette Gallant, Brian Wilson & Mike Love (Beach Boys), John Lennon and Paul McCartney (The Beatles), Justin Hurwitz (La La Land), there will be a premiere performance of “Rise Up” by Gerda Blok-Wilson. Along with the final mass choir piece “The Rhythm of Life” (Sweet Charity), performed by 150 singers from five choirs, the uplifting songs in this approximately one hour show promise to be appealing to all choir friends and family. Admission is by donation. Suggested amount is $10 – 15/person. We hope you can join us! Member of the BC Choral Federation, Choral Canada and the BC Kodály Association. 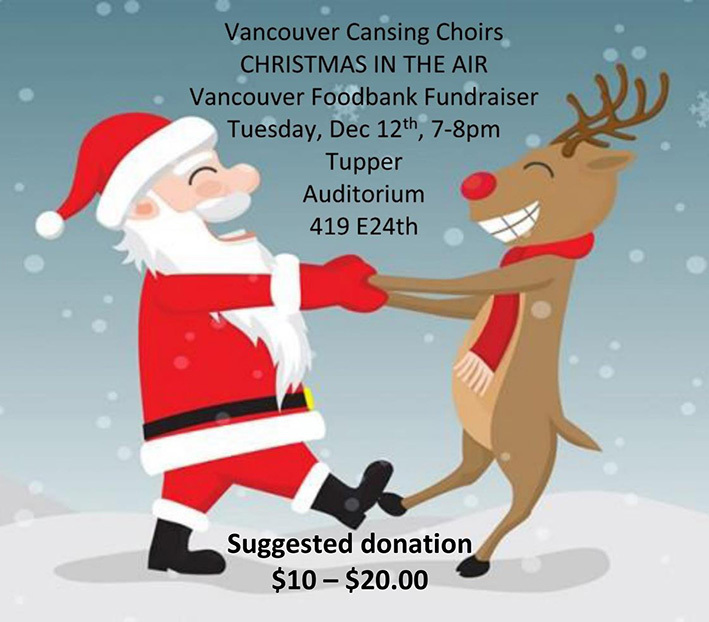 On Tuesday, Dec 12th, 7pm Charles Tupper Auditorium (419 E 24th) will be alive with the sounds of the season as the VCS choirs along with audience for the Vancouver Food Bank. This is the third CHRISTMAS IN THE AIR to benefit the GVFB. VCS choirs will provide family entertainment and also lead the audience in an hour long program of some rousing seasonal music. Invite your family, friends and neighbours. Join the Fun!! The enthusiastic and spirited sound of the VCS choirs is the heart of this event but it’s a fantastic opportunity for the public to join in on many songs in this high energy show. 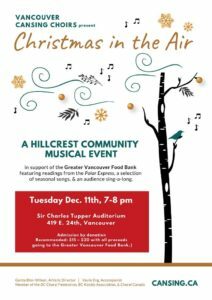 For the Hillcrest neighbourhood especially, this is a fantastic way to reach out and support a charity during this time of year. Last December, the VCS choirs raised $2000.00 after expenses. Admission is by donation ($10 – 20.00 suggested amount). 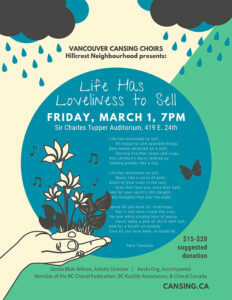 All proceeds (after expenses) will go to the Greater Vancouver Foodbank (no food items please). VCS Level 1 & 2 choirs present LEMONADE and Songs. Friday, Mar 3, 7 – 7:45pm & Tuesday, Mar 7, 5 – 5:45pm Cityview Church (4370 Sophia St.). 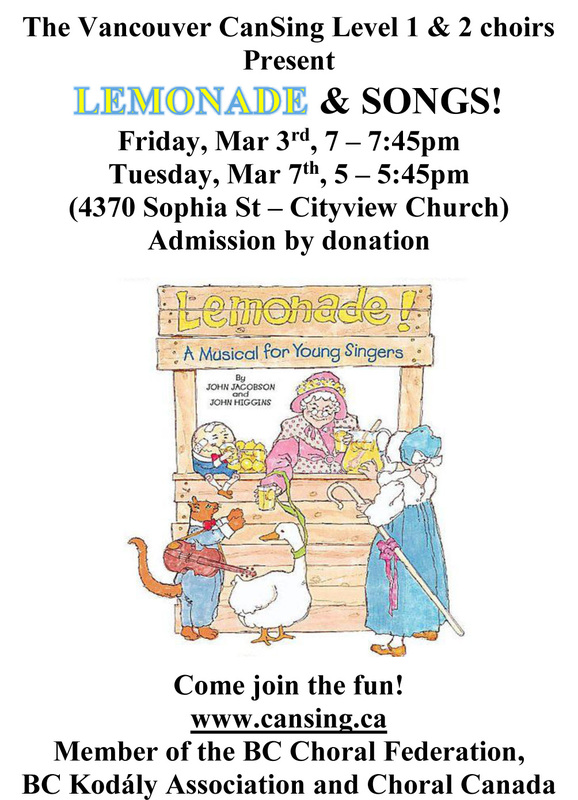 Fri, Mar 3, 7 – 7:45pm & Tues, Mar 7, 5 – 5:45pm Cityview Church (4370 Sophia St.), the Vancouver Cansing Level 1 and 2 choirs, Hillcrest neighbourhood, will present LEMONADE and Songs. Everyone is welcome. Admission is by donation. Suggested amount is $5.00 to cover expenses. 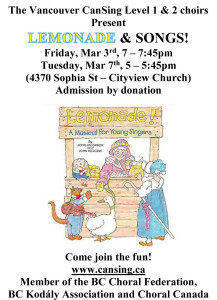 The show will feature a few songs from the Level 1 and 2 choir year and a 20 minute musical called LEMONADE by John Jacobsen and John Higgins. Join in the fairytale frenzy when Chicken Little, the a Little Pig, Humpty Dumpty, the Cat with a fiddle, Little Bo Peep, Little Girl Blue and a host of other characters are having a bad day! With the help of a cheerful Mother Goose, they learn to make the best out of life’s ups and downs. When the world gives you sunshine, don’t live in the shade. When the world gives you lemons…make lemonade! 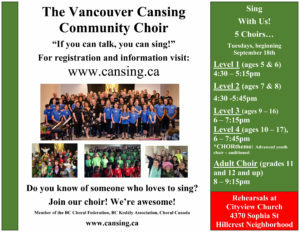 Vancouver CanSing Choir, youth and adult, is a member of the BC Choral Federation, Choral Canada and BC Kodaly Association. CHRISTMAS IN THE AIR, December 13th, 7 – 8pm, Charles Tupper Auditorium (419 E24th). The Vancouver CanSing Choirs, Gerda Blok-Wilson and Kevin Eng will present CHRISTMAS IN THE AIR, a short program of seasonal songs and audience singalong, Tuesday, December 13th, 7 – 8pm, Charles Tupper Auditorium (419 E 24th). Admission is by donation ($10 – 15.00 suggested amount). All proceeds will go to the Greater Vancouver Foodbank (no food items please). With each $1 VCS Choirs donate, GVFB can purchase at least $3 worth of nutritious groceries and fresh produce for the thousands of people they support each week. Family and friends are welcome! Member of the BC Choral Federation, BC Kodaly Association and Choral Canada.